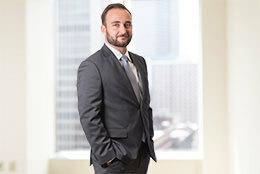 Alexander Alfano is an associate in the Intellectual Property group in Axinn’s Hartford office, where he focuses on patent litigation across a wide range of industries. He received his law degree from Fordham University School of Law, where he worked in the Samuelson-Glushko Intellectual Property and Information Law Clinic. While in law school, Alex also interned at the Federal Trade Commission. Alex graduated from Quinnipiac University in 2012 with a degree in Biology.